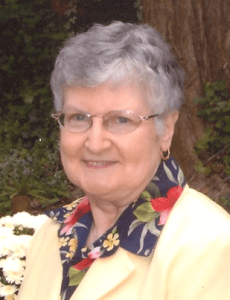 Kelly (Vavro) Malena recalls her first-grade teacher, Sister Frances Hurley, as a “wonderful teacher and a loving person” at St. Bernadette School in Monroeville. Kelly also remembers the rocking chair and “hug rug” that comforted the children in Sister Fran’s classroom – and her family’s annual trips to the Sisters of St. Joseph Harvest Festival. “Each year after we were finished at the Harvest Festival, we would go on a tour of the chapel, the beautiful shrines, Stations of the Cross, and cemetery,” Kelly wrote in an e-mail. Now living in Greenville, South Carolina, Kelly wanted to re-trace the journey of her cherished childhood memories and share them with her husband, Scott, and their two young children, Clare, 3, and Kevin, 18 months. While on a recent family vacation, Kelly re-connected with Sister Fran in Baden who was thrilled to reminisce with her, catch up with her story and meet her family. Serving as hostess and tour guide, Sister Fran walked the family through the Motherhouse with visits to Sister Fran’s local community, the chapel, the parlors, and statues, such as the one that depicts the “Death of Joseph” at the convent’s original entrance. A brisk and sunny October afternoon offered a beautiful backdrop for a leisurely stroll on the grounds where Kelly was drawn to the Stations of the Cross and the refurbished Grotto where she pointed out the shrine of Mary to her daughter. The stop at the cemetery was particularly meaningful to the family because Kelly’s great-great aunt was Sister Euphrasia Condron who died in 1965 at age 78. Sister Euphrasia, who taught in 13 schools in the dioceses of Pittsburgh and Altoona-Johnstown, returned to Baden in 1952 when she lost vision in both eyes. Shortly thereafter, she took Braille lessons, learned to operate a Braille writer, and eventually helped produce Braille books and talking books for blind children. Kelly says that she hopes that the visit to Baden is the first of many family vacations that will include a Catholic dimension for their children. “This was all so special. What an absolute delight to see Kelly after all of these years and to meet her lovely family,” says Sister Fran, who could still recognize a glimmer of the 6-year-old student from the 1988-89 class in the young mother. And what about that “hug rug”? While there was no classroom rug for the Malena family to step on, Sister Fran was generous with hugs of joy and gratitude.